In 1957 only 35 species of Amphibians were discovered from Sri Lanka. This number increased to 53 by 1996, according to the 2012 National Red List of Sri Lanka. In 2004 Global Amphibian Assessment showed that 34 species of Amphibians have gone extinct from the world within the past 500 years and out of this 21 are from Sri Lanka, as of 2012. Among these Sri Lankan species 19 belong to 'Pseudophilautus' the shrub frog. 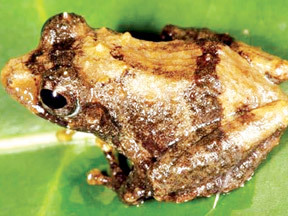 With the rediscovery of Kandyan Dwarf Frog ('Adenomus kandianus') in 2012 and shrub frog 'Pseudophilautus stellatus' in 2013 by leading herpetologist Mendis Wickramasinghe and his team, the number of amphibians believed to be extinct came down to 19. 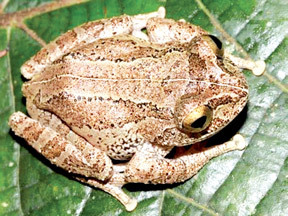 Today the team lead by Wickramasinghe has discovered eight new species of shrub frogs 'Pseudophilautus'. These new members symbolise and remind over and over again the mysteries Sri Lanka's high biodiversity may hold. Those once discovered will surprise the biodiversity enthusiastic world. The new eight species of shrub frogs are named honouring the service of eight prominent Sri Lankans who are historical heroes, conservationists and scientists who have been standing strong in protecting the country and the environment. These eight new species of Pseudophilautus are namely - 'Pseudophilautus bambaradeniyai', 'P. dayawansai', 'P. jagathgunawardanai', 'P. karunarathnai', 'P. newtonjayawardanei', 'P. puranappu', 'P. samarakoon', and 'P. sirilwijesundarai'. L.J. Mendis Wickramasinghe, is the founder and President of the Herpetological Foundation of Sri Lanka, and is the Principal Investigator in this current project. He has close to two decades of field herpetological experience in Sri Lanka with a focus on taxonomic identifications, and also providing education and awareness to the general public on venomous snakes in the island. He has contributed his expertise towards national projects on identification of threatened species in Sri Lanka A member of the Experts Committee on herpetofauna in Sri Lanka, under the National Species Conservation Advisory Group and in several international bodies including several Species Survival Commission groups of the International Union for Conservation of Nature. Other members of the team are Dulan Ranga Vidanapathirana, M.D. Gehan Rajeev, S. Chathuranga Ariyarathne, A.W. Amila Chanaka, L.L. Dharshana Priyantha, Imesh Nuwan Bandara and Nethu Wickramasinghe. 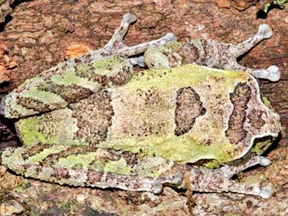 Samples of these new species are deposited in Natural Museum of Sri Lanka, the Department of Wildlife Conservation and National Wildlife Research and Training Centre, Girithale. The new species were compared with all types from Sri Lanka, deposited in the natural Museum and specimens deposited in the Natural History Museum in London. As the team has discovered the conservation status of all species described here, except for Newton Jayawardane's shrub frog, have been considered Critically Endangered considering the ground situation of the animal according to the IUCN Red List criteria. This is because all these species were seen in areas less than 100 square kilometres and are recorded from single locations, and their habitats are under severe threat. 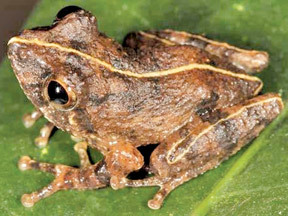 The Newton Jayawardane's shrub frog will have to be treated as Data Deficient as it is described based on a single specimen, according to the research team. In Sri Lanka Amphibians are not killed or collected for economical purposes – not yet recorded. Yet these animals hold a prestigious place in the animal world. Discovery of new eight species shows the importance of more and more research in finding more details about our rich environment – especially those that need to be conducted by local researchers. Though many new species are discovered in this Peak Wilderness it is facing a greater threat from human activities. The highest peak, Sripada, is worshipped by all ethnicities of the country. Peak Wilderness sanctuary is a tropical rain forest that spreads over a land of 224 square kilometers around the Sripada (Adam's Peak) mountain. Millions visit this site every year during the pilgrim season which lasts for a period of six months. Thus garbage gets collected and the natural forest gets over-exploited. The research team during their survey has observed illegal gem mining happening on either sides of the river bank within the forest is another potential threat to the amphibian diversity as well as tea cultivation in the surrounding areas which is slowly expanding. Illegal tree felling to cultivate tea has become a major threat in the area. Peak Wilderness was recently declared as Central Hills World Heritage Site by UNESCO. It is one of the few remaining virgin forests with a continuous natural forest cover and forests that change its characteristics with relevance to altitude and influenced by different climatic zones, researchers describe. As the team continue to highlight amongst the most important findings in this region is the forest die back possibly due to pollution and/or climate change. Accordingly it has never been documented in this region before and a large area has now been affected with the natural forest cover slowly declining. “At the current rate of destruction of the natural habitats in the region the amphibians are at a higher risk of extinction, where they may be extirpated without ever being known to science. The novel descriptions presented here hopefully will set a basis for future conservation efforts in the region,” the research team states. 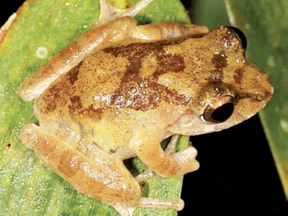 'Pseudophilautus bambaradeniyai' (Bambaradeniyage panduru madiya or in English Bambaradeniya’s Shrub Frog) is named after Channa Bambaradeniya, a leading wetland scientist who has been working immensely to protect the wetlands and its ecosystems in Sri Lanka. This is a small frog found in elevations of 750–1400 m from the forest floor to about 1.5m high shrubs in lowland rain forests to lower montane rain forests. 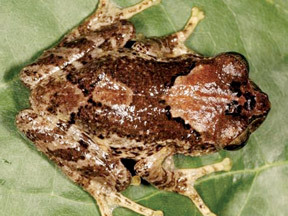 Dayawansa’s Shrub Frog or Dayawansage panduru madiya in Sinhala (P. dayawansai) is named after Nihal Dayawansa, Senior Lecturer of the Department of Zoology, University of Colombo in recognition of his dedicated service and commitment towards amphibian research work in Sri Lanka. The species name dayawansai is a noun in the genitive case. Dayawansa’s Shrub Frog is a small sized frog found in cloud forests of elevation 1550–1900 m above sea level from forest floor to about 2m high shrubs. Jagath Gunawardana’s Shrub Frog ('P. jagathgunawardanai ') is named by the team after Jagath Gunawardana, a leading attorney at law and naturalist, in appreciation of his services towards the conservation of Sri Lanka’s biodiversity and for his efforts on environmental policy making in the island. The species is found mainly in cloud forests of elevation 1600–1750 m from forest floor to about 6m high trees. They are commonly observed on tree trunks with lichens, or were hidden in cracks on barks or on shrubs. P. karunarathnai is named after retired Assistant Director, Department of Wildlife Conservation Y.G.P. Karunarathna, in appreciation of his commendable services to wildlife management which has resulted in the minimizing of the human-wildlife conflict on the island. The species is found in elevations of 750–1400 m, from the forest floor to about 1.5m high shrubs in lowland rain forests and lower montane rain forests. Apart from forests they are also observed in home gardens without much canopy cover. 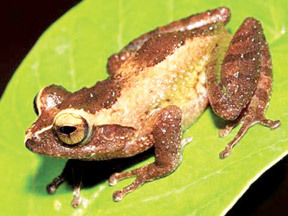 P. newtonjayawardanei or Newton Jayawardane’s Shrub Frog is named after Newton Jayawardane, a leading surgeon by profession and is an ardent naturalist, in great appreciation of his dedicated service to the country, both as a surgeon and a wildlife conservationist. 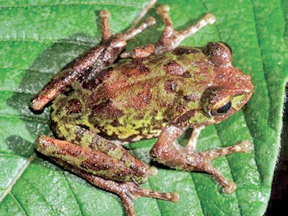 This neither large nor small frog was observed in the forest canopy at very high altitudes with elevations ranging from 1800–2000 metres and was very rare, according to the research team. Only two specimens have been observed so far, from about 8m high trees. They perch on leaves and are very hard to sight. Honouring a hero of motherland Veera Puran Appu, P. puranappu (Puran Appu's shrub frog) is named. Veera Puran Appu whose real name was Veerahennadige Francisco Fernando who was executed by the British in 1848 was a leader who stood against the might of the British Empire. According to the research team, the species was observed even during day time. It was commonly seen perched on rocks in shady places during the day. As they further explained these frogs nocturnally could be observed perched on bushes with about one metre height. Mostly seen in places where there was no canopy cover, in disturbed areas even on the Peak top. The species was commonly recorded from the highest elevations of 2000–2100 metres but low populations were also observed from about 1800m. The other species 'P. samarakoon' is named after Ananda Vijith Samarakoon who is an Assistant Director in the Department of Wildlife Conservation greatly involved in educating and training wildlife officers which in turn have contributed to safeguarding the Sri Lankan biodiversity. The species was found in elevations of 1000–1400 m from the forest floor to about 2metres high shrubs and in bamboo of the lower montane rain forests. They were commonly found perched on bamboo plants close to the stream. P. sirilwijesundarai is named after one of Sri Lanka's leading botanists Dr. Siril Wijesundara. At present Dr. Wijesundara is the Director General of the Department of Botanic Gardens under which the Peradeniya Royal Botanic Gardens is operated. As the researchers explained the species was found at high altitudes of elevations ranging from 1600–1700 metres in the montane cloud forests. They were found in the canopy on trees along side mosses, from about 10metre tall tree branches.